Well after a couple of failed attempts at making a decent box for my new subs I have made this one. The port is 6 inches wide, 14 inchs tall and 19 inchs long. 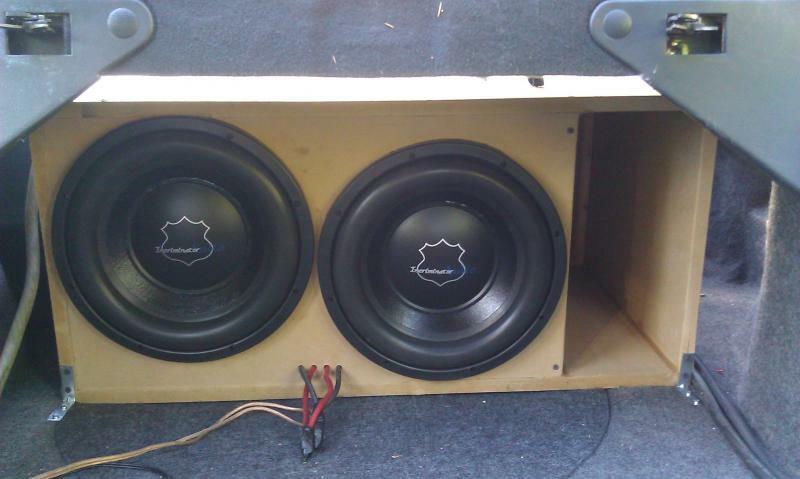 Subs in the box are incriminator audio lethal injection 12's. My amp is the BIG one now, was the smaller one before. That amp is a powerbass 4000xta powered by a xs power d3100 in the trunk basically right beside the amp. I plan to use some b quiet and deaden the trunk totally and run some more zero gauge runs from the battery under the hood to the back battery. 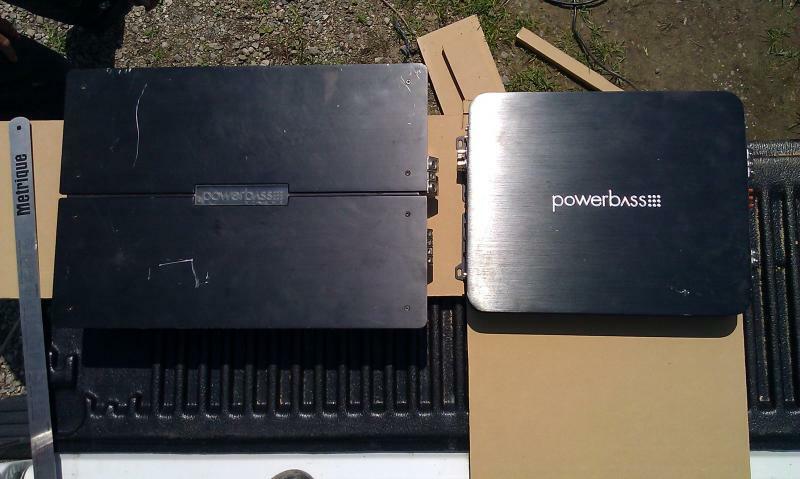 Also I am looking to buy a xs power d3400 to stick under the hood. The box will get some fiberglass resin here with in the next couple weeks. All and all I am impressed with what i have done so far with some words from a few people and thats about it. Thanks luke and dale, and bill need to get on that meter of your buddy. ya no, nothing to do with marty this box, this is a box design I came up with. Just a bunch of number crunching and trying to figure out an aprox port size and now this thing hammers in my car. Just in fact did some more sanding on it today and painted it. Gonna be re-installing all my gear in next week or two. I sanded that thing for 3 hours a few days ago and got the edges of the port smoother and rounder as well as I painted the box to. Enough port area or is that box huge or tuned high? 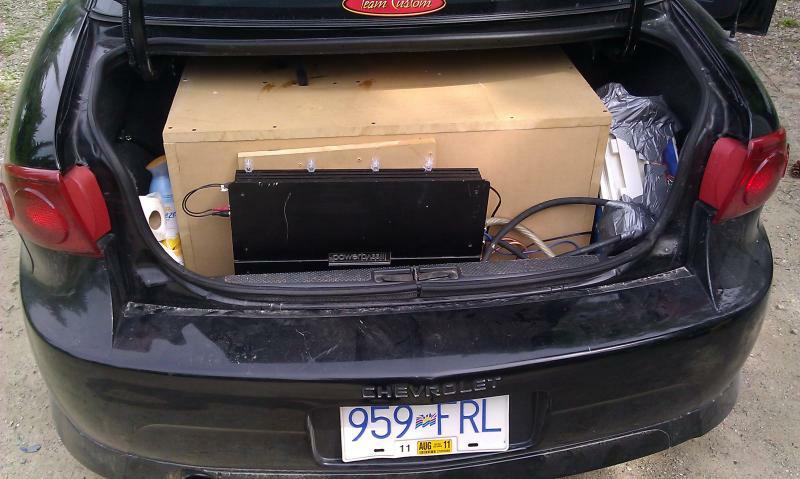 box is not huge fits in the trunk of my cavalier no problem, and its tuned aprox for 45hz. I love the saftey measures taken in the trunk for the second battery. much better safe then sorry. I would rather duct tape the hell outta it then let that massive battery arc out and start a fire or even worse cook my amp. Mind you there is so little room for it that u have to wedge it into place and with its weight its just sits there.